BMW has made a name for itself by staying on the cutting edge, from car design to automotive technology and, of course, the marketing of its luxury vehicles. Once again, BMW races ahead of the advertising curve with this stunning BMW projection promo that highlights their vision for the future of mobility. Using digital projection and motion detection technology, it digitally transforms all passing cars in Manhattan into the all-electric BMW i3 and other innovative vehicles in real-time. 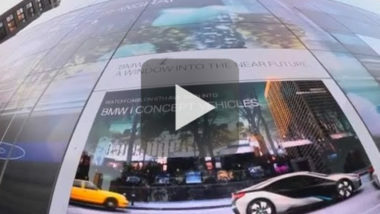 Then, the projection offers a behind-the-scenes peek into just how they created this dazzling digital promo. Rick Mathieson’s GENWOW blog spotlighted the progressive projection, so take a sneak peek at BMW’s forecast for the future. MDG Advertising, a full-service advertising agency with offices in Boca Raton and New York, NY, is one of Florida’s top integrated marketing agencies. Clients benefitting from MDG’s targeted and integrated 360° marketing solutions include The Breakers Palm Beach, Dental Care Alliance, IBM Southeast Employees’ Federal Credit Union, Lafayette Federal Credit Union, The Seagate Hotel and Spa, Carls Patio, Brain Balance Achievement Centers, South Florida Fair, MDVIP, Round Hill Hotel and Villas, TooJay’s Gourmet Deli, Upfront Foods, Signature Consultants, World Fuel Services, Benetrends, Primary Pharmaceuticals, Max Planck Florida Institute, and HCA East Florida. To stay on top of the latest advertising and marketing trends, contact MDG Advertising. Read more at Mathieson.com.